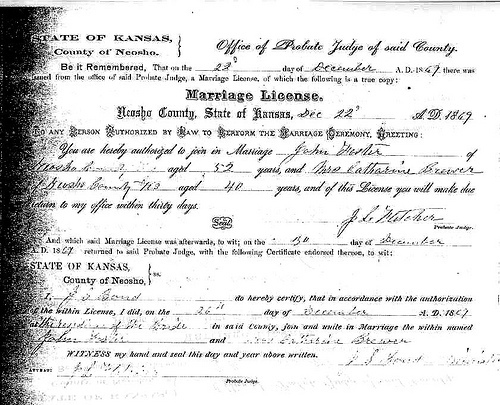 Above is the Neosho County, Kansas marriage license, Dec. 22 1869, of Catherine Hedden Brewer and her second husband, John Foster. Born Feb 21 in Shelby County, Kentucky, Catherine was first married on March 30th 1843 to Daniel Levi Brewer (this blog’s direct line). John W. Foster had previously been married to Hannah Oury, who had died Jan 31 1868 in Neosho.He would live to Aug 28 1895 and die in Canville, Neosho, Kansas. Catherine lived to May 25, 1903 and died in Greenfield, Dade, Missouri.